California data source: CA Census 2010 Profile. UCSD data source: UC San Diego Undergraduate Enrollment Statistics. “Asian” category includes self-identified Filipino-Americans for simplicity. Percentages do not sum to 100 due to rounding, double counting of multiple ethnic affiliations, deletion of certain ethnic affiliations (multiracial, declined to report). 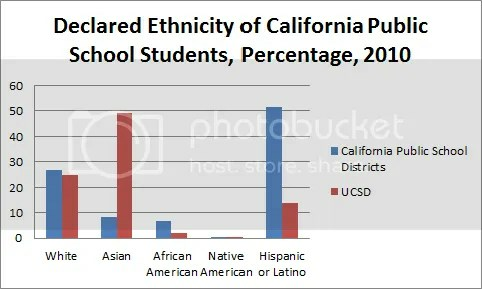 California school data source: CA Department of Education. Interesting. White students are close to proportional representation, while Asia-Americans are more dramatically over represented and Hispanic or Latino students further underrepresented. There is a bias in the data though — because the available data only reports public school students, it likely undercounts whites and especially Asians, both who enjoy above average incomes and are proportionally more likely to send their children to private schools. Despite these bias problems this is still an informative visual representation, and it is interesting that the student body at one of California’s premiere institutes of public education doesn’t look anything like the society it serves. Update: Minor correction for clarity. I think you mean that whites and Asian are more likely to send their children to *private* schools. Interesting point – but this doesn’t acknowledge that the students identify as “Asian” are not necessarily “Asian-American.” What’s the proportion of international-Asian students? Seems to me that there is a growing number of Asian students applying directly from urban mainland China and Taiwan, South Korea, and I think to a lesser extent Japan. That’s a good point, but I don’t see it significantly changing these results. Asian student enrollment at UCSD is so high relative to the actual California Asian-American population that it is unlikely that international enrollment significantly affects this disparity. Really this is a question that could be answered by better data. Interesting post and good point Kim. It seems that Native American representation at UCSD is relatively proportional to the Native American population in California, but I think this image of proportional representation at UCSD is somewhat misleading since San Diego county has more Native American reservations than any other county in the US. Despite the over-representation of Asian students in this supposedly colorblind UC system, I think it’s worth noting the scholarship about a glass ceiling for Asian-American students at top private schools. It’s a good thing the graph doesn’t look anything like the society it “serves”. America should strive for more ethnic diversity as opposed to catering to the white supremacists’ ideologies. Asians are underrepresented everywhere else—in America’s entertainment industry, politics, and many other fields. They have to start somewhere and what better place to start than in education? 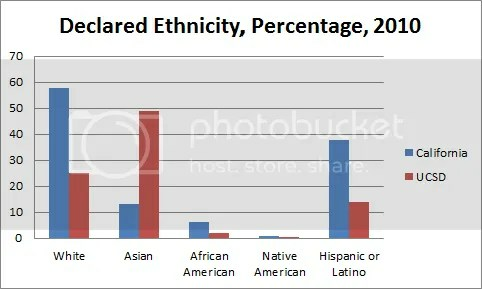 It just goes to show how far California has come along and how much more needs improvement in terms of racial equality.